Sam is an affable but aimless young man with an interest in conspiracy theories and finding hidden messages in everyday popular culture, who lives a lazy, jobless life in Los Angeles. One day he meets and develops a crush on his new neighbour Sarah. She tells him to come back the next day, but when he does, she and her roommates all seemingly moved out during the night. Meanwhile, he becomes fascinated with a graphic novel titled Under the Silver Lake, which features story elements reminiscent of recent real-life events such as a serial dog killer. After following a woman he spotted going through Sarah's apartment, Sam starts following a chain of individuals and events in the hopes of finding information about Sarah, and starts believing he is being followed. However, he later identifies Sarah as one of the three women who died in a car fire alongside billionaire mogul Jerrerson Sevence, recognizing one of the victims' hat to be hers. 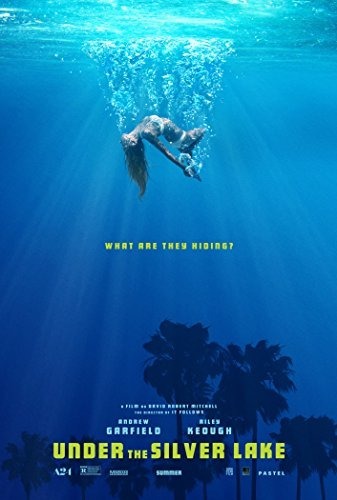 After a conspiracy theorist friend of Sam obsessed with the back cover of an old cereal box is found dead from an apparent suicide, Sam learns from reviewing his friend's security tapes that he was killed by the Owl's Kiss, a womanly creature from Under the Silver Lake; he concludes that his friend's death is related to the ongoing conspiracy.